I love good books! But what do you do with the not so good ones? If you are an avid reader like me, then you will undoubtedly have the occasional impulse buy or book fair purchase that didn’t turn out to be the keeper you thought it would be. Even more likely is that you have some books laying around that were given to you as gifts that did not suit your reading palette. May I suggest creating some altered book art? Making an altered book is like no other art project you’ve ever done. The book itself serves as your canvas and you take it from there. No rules, no limits! Below are pics. of an altered book I recently finished. One of my favorite things to use in my artwork these days is pieces and pages from some Bibles that have fallen into disrepair. There is something intriguing about taking a piece of text out of the Bible and highlighting it in my artwork. When the words are singled out and put in a space with colors and images that help convey the meaning and significance, the results are powerful! This is especially true with familiar verses. It’s as if you are reading them for the first time when they stand alone in this way. 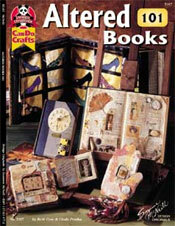 If you are interested in making an altered book I highly recommend this instructional book , Altered Books 101 by Beth Cote and Cindy Pestka. So beautiful…I want to get my act together and start making some art out of all this stuff in my closets!! Wow!!! This is awesome! I love the colors. Your art is so inspiring I love it!